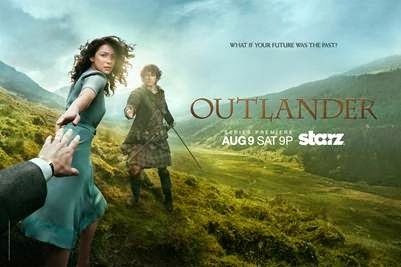 "STARZ releases a first look at the opening title song and sequence of its highly anticipated original series “Outlander.” The opening showcases never-before-seen footage from the series, along with an arrangement of the “Skye Boat Song” by Emmy-award winning composer Bear McCreary featuring the vocals of songstress Raya Yarbrough (below). The network first shared the main sequence upon over 1,500 enthusiastic fans at the Comic-Con world premiere screening of “Outlander” at San Diego’s historic Spreckels Theatre on Friday night. “Outlander” premieres on Saturday, August 9th at 9pm ET/PT on STARZ." Download the Original Opening Title Song from Bear McCreary on iTunes here! OMG!!! Bear McCreary has totally nailed the score for Outlander! BEAUTIFUL!!!! I had goosebumps and tears while listening to it the first time. I replayed it multiple times, watching the video, and with my eyes closed--same affect: Heart swelling with warmth, emotions so deep, pictures in my head of beautiful Scotland with Jamie & Claire---Amazing work, Bear! THANK YOU! <3 Can't wait for a complete soundtrack to be available--have no doubts that it will!!!!! Again, Thank you! The song is available on itunes for pre-release purchase. I want the soundtrack and DVD! OK, I'm just going to admit that I'm weeping. This is so beautiful and so much more than I hoped for. I just got goosies. And I'm feeling claire-voyant as I did a version of the "Skye Boat Song" as my "Ballad of Claire". This has been one of my all time favorites Scottish songs of all times. I simply love it! Why can't Aussies view all this stuff. Searched the net to no avail!!!! Oh I so can not WAIT! What was the thing you guys mentioned in your video about a sneak peak on 8/2? Normally, I come up with a signature cocktail for something this awesome, but I had an even better thought for the premier. I'm going to make an ice cream concoction. Vanilla ice cream, softened and blended with crystallized ginger, pour a nice scotch, maybe Oban over top, then sprinkle chopped, chocolate covered crystallized ginger on that. This so beautiful! I have watched it over and over and I still get goosebumps!! !